The staff was fantastic and very helpful. The resort was very clean! The new renovated rooms are fantastic. The transportation was great except for the morning of the marathon which was expected. Like all Disney properties this restore was well kept and beautifully themed. I stayed in a newly renovated room that was beautiful and comfortable. Transportation was very slow from resort to Disney Springs and coming back as well. Needed more buses by the time we were picked up at All Star Movies. Too many people had to stand. Not safe for young and elderly. Everything was clean and refurbished. Custodial crew came out immediately to replace broken bed rail. Good location. Helpful staff. Clean and well organized. This property is in need of some serious refurbishment. As. Disney property, it was a disappointment. The room was below average for the price. Cleanliness was just so-so, plumbing fixtures were not up to snuff, and the thermostat seemed to be ignored by the AC. We’ll not be using this facility again. Always affordable and reliable Disney cast members always a pleasure to work with. Shuttle bus is convenient between the hotel and each Disney park. Restaurant also convenient, late open and good taste. I loved the refurbished rooms! My only issue would be that the front desk is always extremely slow to wait on customers no matter what time of day I went in. I prefer the new look then the old because it looks cleaner and more spacious in my view. Wood floors are much better than the previous carpeted rooms and the bathroom has much more light than the old style of rooms had. Also, I did not like that they got rid of alarm clocks! Checked in, went to the room, and it reeked of mold. The room was VERY small and outdated. We left the property and checked into Disney’s Art of Animation Resort, SO MUCH BETTER! Close to Epcot and Hollywood Studios! Very friendly and helpful cast members. The mood was very easy going! Overpriced for the quality of the rooms. Not even a coffee maker in the room. Much better value at off-site budget hotels. Or spend same money and have much nicer room at a Marriott property nearby. 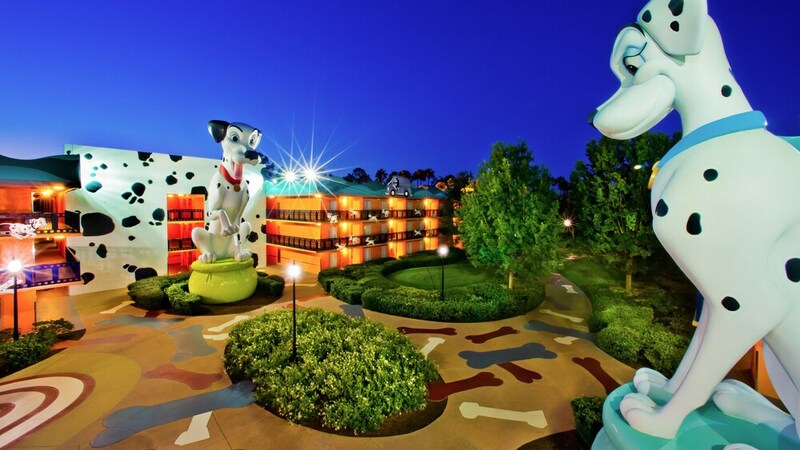 Located in Bay Lake, Disney's All-Star Movies Resort is within 2 miles (3 km) of popular attractions such as Disney's Winter Summerland Miniature Golf Course and Disney's Blizzard Beach Water Park. This 3-star resort welcomes guests with 2 outdoor pools, a restaurant, and free in-room WiFi. Enjoy a bite to eat at World Premiere Food Court, the resort's onsite restaurant. Start each morning with cooked-to-order breakfast, available for a fee from 6 AM to 11:30 AM. A TV comes with satellite channels, and guests can stay connected with free WiFi. Other standard amenities include a refrigerator, free local calls, and a hair dryer. Disney's All-Star Movies Resort offers 2 outdoor pools, an arcade/game room, and express check-in. If you drive, self parking is USD $13.00 per night, or you can take advantage of the free airport shuttle (available 24 hours). The 24-hour front desk has multilingual staff ready to assist with tours or tickets, dry cleaning/laundry, and securing valuables. Other amenities at this family-friendly resort include express check-out, laundry facilities, and a gift shop. Cooked-to-order breakfast is served daily from 6 AM to 11:30 AM for a fee. World Premiere Food Court - Restaurant serving breakfast, lunch, and dinner. The resort has 2 outdoor swimming pools.